Listen in to learn about Gwen’s fascinating journey to life as a best-selling author about cats, and how a stint in marketing at Rolling Stone Magazine propelled her into writing her first manuscript. Not only is she a fantastic writer, but she is an impressive and creative marketer as well. Gwen’s passion for her platform, innate knack for marketing, and love for her readers has gained her (and Homer) a substantial social media following, and also led her to create her Curl Up with a Cat Tale series. This lighthearted, creative, and passionate episode is one you don’t want to miss! Gwen Cooper is the New York Times bestselling author of four books, including one of the most successful cat memoirs of all time, Homer's Odyssey: A Fearless Feline Tale, or How I Learned about Love and Life with a Blind Wonder Cat. Gwen is not only a fantastic writer, but an impressive and creative marketer as well. BenBella Books feels very privileged to be publishing her next two books, My Life in a Cat House and Homer and the Holiday Miracle. Glenn Yeffeth: Welcome to the Building Books Podcast. I'm Glenn Yeffeth, publisher of BenBella Books, and on this podcast we will talk about ideas, authors, and how publishing really works. Glenn Yeffeth: Well good morning. I am thrilled this morning to welcome the brilliant Gwen Cooper. Gwen is the author of four books, including one of the most successful cat memoirs of all time, the breakthrough bestseller, Homer's Odyssey: A Fearless Feline Tale, or How I Learned about Love and Life with a Blind Wonder Cat. Glenn Yeffeth: Gwen is not only a fantastic writer, but an impressive and creative marketer as well. So I feel very privileged that we will be publishing her next two books, My Life in a Cat House and Homer and the Holiday Miracle. Welcome Gwen. Gwen Cooper: Thank you so much for having me. Glenn Yeffeth: It's my pleasure. Well, this podcast, we talk a lot about books and upcoming books, we also talk about the writer's life. And you've had an amazing career. So I'd love to just start at the beginning of how you decided, when and how you decided to become a writer. Gwen Cooper: This feels very, tell us about your career, slugger. Gwen Cooper: You know, I honestly don't remember a time where I didn't want to write. I think the first time that I, as a very young child realized that not only did book's exist, but there were people who wrote them, as soon as I had that epiphany I aspired to be one of those people. Gwen Cooper: I majored in creative writing in college and I actually ended up going into marketing communications, first in nonprofit and then in the private sector. Gwen Cooper: Actually, so my story of how I decided to become a writer was, I was working at Rolling Stone magazine, in the marketing department, and we had a new marketing director came in, and he gave everybody in the marketing department a writing assignment. No matter what your job description was and it was for a hypothetical ad campaign, marketing campaign for the magazine. Gwen Cooper: And so when I turned mine in, the new CMO was very impressed, he brought it upstairs, he brought it to Jann Wenner, who was very impressed and decreed that from then on, I and I alone would write all of the marketing copy for Rolling Stone. Gwen Cooper: Yes. And even though it was just marketing copy, I was thinking, this is Jann Wenner. This is the publisher who has broken many renowned and famous authors and that first introduced them to the public. Gwen Cooper: And if he is impressed, this impressed with my marketing copy perhaps I should be applying my talents elsewhere. And here we are today. Glenn Yeffeth: Now did you go through the usual process of putting together a draft and finding answer agent and all that? 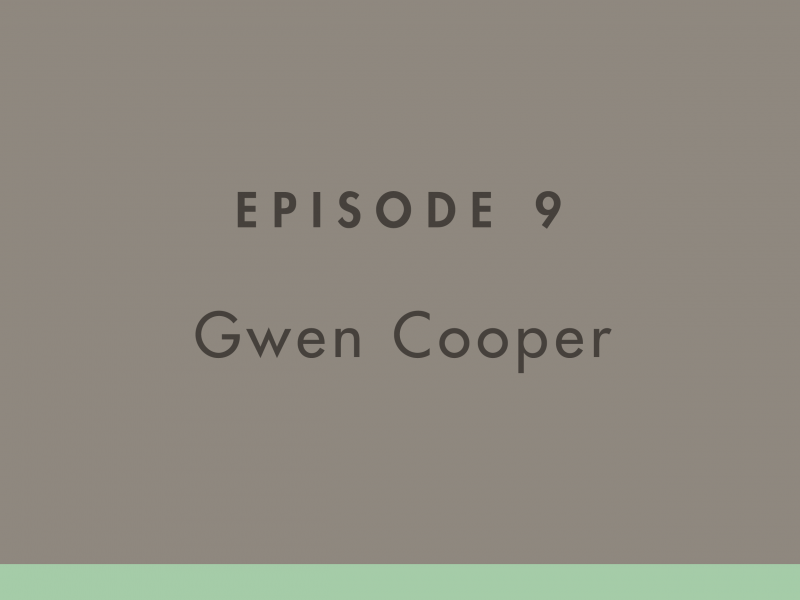 Gwen Cooper: Yes, so I continued to work full time at Wenner Media for the next year and a half, and I wrote my manuscript and I was simultaneously looking for an agent. I did it purely over the transom, we did an old fashion way. When people write to me today and they say, how do you find an agent? How do you become a writer? Gwen Cooper: I always tell them, I literally started out by googling, how to find literate. And we truly, we live in answer age where we're of instant information of miracles and wonders. Gwen Cooper: I read a lot of articles and I bought some books and learned how to write pitch letters and what they should say, and how you should decide who to send them to and the kind of research you were supposed to do. Gwen Cooper: And while I was writing, I was simultaneously pitching, I had like at any given time I had five pitch letters out, and as soon as a rejection would come back, I'd stuff the next one in the envelope and send it back out. Gwen Cooper: And so by the time I finished the manuscript I had a few agents who wanted to look at manuscripts, and yeah. Got my first agent, sold my first book. And again, I feel like I keep ending sentences this sway, here we are today. Glenn Yeffeth: Great. Now, so that first publication where you were an unknown writer, had this book out, what did that feel like? Gwen Cooper: It's interesting right, because I mean obviously a lot of what you read is, will be people telling you that's essentially impossible for an unpublished author, an unpublished writer to get a book deal. Gwen Cooper: When I say unpublished, I mean I hadn't even written like magazine articles or oped pieces or anything, short stories, nothing of that nature. I think you just have to be really stubborn. Gwen Cooper: I know you didn't exactly ask an advice question, but what the experience was for me was a lot of, I don't care, I can do this or I can't. I think I can, I never advocate what sort of blindly arrogant self-confidence, I think at a certain point, if the entirety of the publishing industry is telling you that you should not be published that is something you should begin to consider. Gwen Cooper: But the short of generalities, it's really tough if you don't know somebody, it's really tough if they haven't, if nobody's come to you saying you'd like to see a book. It's really tough if you don't already have a list of credits. Gwen Cooper: It's really tough and nearly impossible, I think are the kinds of things that you should feel free to disregard if you are confident in what you're doing and in your ability to convey your skill and enthusiasm to others. Glenn Yeffeth: Right. And you know, it's possible to get a lot of rejections because your manuscript isn't very good, but it's also very possible to have a fantastic manuscript and get tons of rejections as we've seen through everybody from Harry Potter to Gone with the Wind had many rejections and then they ultimately got accepted. Gwen Cooper: Well I mean absolutely, and I should backtrack a little bit and say, when I say the entirety of the publishing industry, I don't necessarily mean if you're gotten a lot of rejections, because that really, really is part of the job, is getting rejections. Gwen Cooper: I never heard of anybody, no matter how successful they are, who does not have a stack of rejection letters and a whole bunch of rejection stories to go with that. But I have in writing workshops, I've met people who for five years have been in a constant state of sending out queries and getting rejections. Gwen Cooper: I think at a certain point, when you hit a point where your sort of marking annual anniversaries, if it's not the writing then it's definitely your approach, and it's something to reconsider. Glenn Yeffeth: Now your second, is Homer's Odyssey your second book? Gwen Cooper: It was my second book, yes. Glenn Yeffeth: As we all know, that was a phenomenal success, hitting The New York Times list over and over again over a period of years if I remember, but I feel like, especially when reading your book, how I learned about that we're bringing out now, My Life in A Cat House, it seems like you went into that writing very strategically. Gwen Cooper: You mean the writing process itself or the process of signing? Sorry. Glenn Yeffeth: Starting to write about Homer, and deciding to do a cat book when your first book was a novel. Glenn Yeffeth: But doing sort of a memoir. Now I'm sure it was from the heart, but at the same time it sounded like there was a bit of strategy here as well. Gwen Cooper: I can't pretend that I don't have a background in marketing and that it's not, and that the possibility of a commercial angle for my work never comes into play, because obviously it does. So with Homer's Odyssey it was really sort of a left brain, right brain, a perfect marriage of the left brain and the right brain. Gwen Cooper: Because of my marketing background, I had a wealth of information at my disposal about the number of cat owners in America. How many cats they have, where they live, what their disposable is, how many books there are out there for them, how many books this audience buys, whether or not cats are their subjects, in any given year. Gwen Cooper: And I felt that because there were so many cat lovers and so few cat books that just from a marketing perspective represented a clear market opportunity. But the same token, I would not have done, you can't sell anything to anyone no matter how underserved the market is if you don't have a good product that they're going to like or hopefully love. Gwen Cooper: I also simultaneously really have the feeling that this was just a great story about this amazing blind cat and the heroic things that he had done. And the kind of story that I as an animal lover would love. And I felt that I could make it, build a good narrative out of it and so if I hadn't had that sort of emotional, I just believe in the story feeling, then all of the marketing stuff would not have mattered. Gwen Cooper: By the same token, if I'm being honest, if I had just felt that I had a wonderful story to tell but didn't necessarily think it was going to appeal to anybody, I don't know that I would have gone forward. So it was really the marriage of the two. Glenn Yeffeth: I love you saying that Gwen, because I think it's so wise. I mean, there's a big emphasis now in publishing on platform, everyone needs to have a big platform and I see so many things with a big platform, but they don't have a quality book. And it's always like the quality of the book became the least important aspect of getting a book deal. Glenn Yeffeth: And really in the end, the reason so many people bought this book was because so many people loved the book, and the reason so many people loved the book was because the book was fantastic, and you can't get away from that. The marketing, you're pushing a string if you've got a weak book but a great platform. Gwen Cooper: Yeah, absolutely. I think that's something, and certainly not just in publishing but absolutely, that is also overlooked. There's a lot of focus on, and I understand it, it's write me, it's very difficult. Gwen Cooper: Especially in an era of vanishing book sections and newspapers, and sort of the industry platforms for books and so, there is a lot of emphasis on the marketing aspect and how you can reach people. Gwen Cooper: But really the first rule of marketing is, people have to like the products, it really is that simple. And because you're not going to sell anything to anyone if they don't like it. Gwen Cooper: I thank you for your very kind words about Homer's Odyssey, but you know it was really the case when I sat down to write, that really did come from the heart, it was the great instance as a person in marketing where you are your target audience. I'm passionate in my love for animals and I am glad that was conveyed to my readers. Glenn Yeffeth: You know, when you came out, when your agent was pitching Homer's Odyssey, were the publishers like, oh there's so many cat readers and there's so few cat books, we're dying to have this, or did they not get it? Gwen Cooper: No, my stars, no. My goodness, no. We got a lot of rejections for Homer's Odyssey, probably I guess my personal favorite was when we'd hear that Homer was not special enough. You know, so Homer was not just blind, he had no eyes, he was an eyeless cat. Gwen Cooper: And in the original proposal, the subtitle, what was Tales of an Eyeless Wonder Cat. So like a lot of the like and love, none of that was in there, and instead of saying blind, I said eyeless. Gwen Cooper: And so when I would hear that Homer wasn't special enough, my feeling was always like, I mean, I don't know, when I tell people at cocktail parties that I have a cat with no eyes, it usually arrests their attention for at least a moment. Gwen Cooper: They're like wait, no eyes? And I was like does he need to have no eyes and juggle? You know? Does he need to have no eyes and also be a tap dancer? What is the definition of special here? I mean he also, you know, he chased a burglar out of my apartment, out of my bedroom in the middle of the night one night, I mean there was this whole story where he literally saved my life. Gwen Cooper: And I was like, I don't know what you're looking for in the way of special, if not a blind, heroic, lifesaving cat. But okay. Glenn Yeffeth: He can cook a ten course meal. Gwen Cooper: Yeah, I mean, yeah. Like on the special skill section on his resume, fluent in French. You know like that frog in those old Warner Brothers cartoon who can sing. Anyway. Gwen Cooper: So we heard that and we heard that you know, a lot, we heard a lot of the catch 22 logic of, there are, where I felt was a lack of cat books represented a market opportunity, we heard quite a bit that there were no cat books because cat people didn't want them. Gwen Cooper: And so my argument is always, well how do you know they don't want them as those books aren't there? And it was this sort of circular logic. I also heard that, and this is actually one of the titles in my forthcoming book, one of the chapter titles, cat lovers don't read books, which always struck me as sort of particularly odd observation as in so far, as isn't that sort of the stereotype of the socially maladjusted cat lady, who's at home alone, due to her lack of social skills? Gwen Cooper: And it's not something I believe but if we're going to be trafficking in baseless stereotypes. So, yeah. So there was a lot, ultimately obviously the book found a home, but it was not in, it was not the hardest path, but it was not the easiest path. Glenn Yeffeth: I mean there's so much group think, especially with the big New York publishers, where it just, I guess its inevitable, you're trying to chase. Glenn Yeffeth: It's so hard to predict what books are going to sell, and so you're either led by well, there's a lot of other books out there, maybe there's too many so we won't do that, or there aren't any books so probably nobody wants them. Glenn Yeffeth: So how do you publish anything? Gwen Cooper: It's a real small Vegas needle that you're trying to thread there. Glenn Yeffeth: But I remember reading about Judith Regan who made a fortune with these wrestling books, and the belief in the industry was, these wrestling middle of the country people don't know how to read, they would never read a book. And of course they sold quite a few of those books. Glenn Yeffeth: And so it's always nice to get out of the group think. Gwen Cooper: Yes, absolutely, hey that's, you don't say, it's never a pack of people right, who accomplish the really big things. It's always somebody who's thinking a little bit outside of the box or a little bit differently. Glenn Yeffeth: You built really a very impressive Facebook and social media platform in connection with your writing. Glenn Yeffeth: What was the chicken, what was the egg? Was Homer's, did Homer's Odysseys' success lead to a huge platform or did that platform drive the success? Or how did it work? Gwen Cooper: Yeah, you know it's interesting, I was actually just interviewing on this very subject for a Canadian cat documentary yesterday. It's a documentary about famous cats on the internet, and Homer's Odyssey came out when famous cats were not really things. Gwen Cooper: There was no grumpy cat, there was no Lil Bub, everyone knew maybe who Felix the cat was and the fan fiction's version and Hello Kitty. Glenn Yeffeth: Now was Dewey, was Dewey the library cat out at that point? Gwen Cooper: Yes, Dewey the library cat was out, and so I would say in terms of things cat, he was definitely, probably the only winning cat who was what we'd call famous, but he did not have necessarily social media, he wasn't internet famous. Gwen Cooper: And again, this was sort of before the entire phenomenon of cats on social media when Dewey came out. Dewey was famous through what we think of more traditional ways, there were newspaper articles, there were TV stories, TV news stories, things like that. Gwen Cooper: So definitely the success of Homer's Odyssey came first. About a year and change after the book's publication, I started a Facebook page for Homer, which I was initially resistant to doing, again because at the time it just, and this is only a few years ago, which it's just amazing how rapidly this has all changed. But at the time, it just felt weird to have a Facebook page for your cat. Gwen Cooper: But I started one, at the time of his death, and it amassed 13,000 followers which struck me as a hugely, a huge and insane number of people to be following a cat online. And then after his death was really when I mean across all platforms, on Facebook, on Instagram, on Twitter, the community of people who had read the book and loved him, coalesced online in these online communities. And now we have something like 890,000 followers on Facebook and another 30 or 40,000 on Instagram and Twitter. Gwen Cooper: I mean the Instagram account is only four months old, and we're coming up on 20,000 followers. And yeah, it's just been a really, really interesting phenomenon to observe in the last, let's say five, six years. How that's all developed. Glenn Yeffeth: Wow. And so a lot of that happened, really, it sounds like the success of the book drove that success of the social media. Gwen Cooper: Yes, absolutely. Absolutely. And I would say Homer's passing also was a big impetus for the social media. Again, there were so many people who had been so, who had loved his story and were so affected by his life, and who came together following his death. Glenn Yeffeth: Now you had this very innovative idea that we're pursuing now, this online Curl Up with a Cat Tale series. Tell us about that. Gwen Cooper: Yeah, so what happened was, I have now this huge social media community, which is wonderful and it's great. By the same token, as you know, social media moves very quickly whereas the publishing industry does not. Gwen Cooper: I mean even when it's moving quickly you're looking at lets say two to three years lag time between books. And that's just the nature of the business, that's not at all a criticism, it's good, I mean it takes a while to write a good book and to have someone edit it and make the changes, I think it's good that it's an intensive and time consuming process. Gwen Cooper: But in the meantime, you have this social media community that's at least in my case, had built up around the cats, and they want to know what the cats are doing and they want fresh material about the cats, on a fairly regular basis. Gwen Cooper: A YouTuber can put out two or three new videos a week, and an Instagrammer can put out two or three photos a day. And I do those things, but first and foremost I'm a writer and it's hard to keep, I mean you certainly can't match the pace of two or three times a day. And so that was how I came up with the idea of Curl Up with a Cat Tale which is a monthly E short story subscription series. Gwen Cooper: And so people, readers subscribe, they pay a onetime subscription fee and then for the first week of every month for the following year they get a new story, 30 to 50 pages, usually between eight and ten thousand words, and some of the stories go back a little further, they're about the first cats I adopted before Homer. Gwen Cooper: Some of the stories are much more contemporary and they're things that are happening in our lives right now. My feeling was that I wanted people to, I wanted to find a way through my writing to keep people who felt invested in our lives on a day to day basis, to feel like they were getting not just pictures but a writing update on our lives on a regular basis. Glenn Yeffeth: That's great. And tell people if they want to find those where would they go? Gwen Cooper: That's right, I'm not even thinking about plugging, I'm treating this on a much more professional level, but it's, I'm not shamelessly self-promoting like I should be. Glenn Yeffeth: We can plug a little bit. Gwen Cooper: We can plug a little yes. Glenn Yeffeth: We can plug a little. Gwen Cooper: So, my bad. So it's gwencooper.com/cattales. And that's C-A-T, T-A-L-E-S, gwencooper.com/cattales, and you can learn more about the Curl Up with a Cat Tale series, see some of the stories that we've published so far. Gwen Cooper: You can also sign up for my mailing list and download a free story if you're on the fence and you're not entirely sure about this sketchy sounding newfangled monthly short story series. Gwen Cooper: You can see what it's all about. And its been going really well so far, and the readers love it. It's great, I hear every day on my Facebook page, somebody will post that it's just great to have the stories to look forward to every month and things of that nature. They really like getting these monthly dispatches sort of in between longer books. Glenn Yeffeth: I think it's great. And you were very kind about the lengthiness of the publishing process, but as a publisher, it's frustrating to me, in the world where everything is moving so fast, that it takes us a year to put out a book from the time the person submits a manuscript. Glenn Yeffeth: And it's always possible to do it faster, but to do it right, the industry standards and getting in the book stores and all that stuff sort of forces that pace on you, and what I love about this sort of experiment we're doing with you is, we get to release the stories as you write them, we do a thorough editing on them before we release them, and then we can collect them in a book for people who want a more substantial read. Glenn Yeffeth: And a number of those stories coming together, it's going to be the book that we're bringing out, My Life in the Cat house. Gwen Cooper: Yeah, I feel here that I should really give a shout out to my long suffering editor, Leah Wilson, who I just keep constantly busy, because really we are sort of in a constant state of putting one story to bed or working on the next one. Gwen Cooper: And I find myself when I'm writing trying very, very hard to make her job as easy as possible. We're sort of in a rhythm now where all right, this is the kind of thing Leah's going to object to and I want to save her the time of having to note it or rewrite it or ask a question like, is this really what the cat, is this really what you want to say here? Gwen Cooper: And because god bless her, she is fantastic, she really is a phenomenal editor and I feel sort of like we're in this abusive entity, of my making and so I really do want to give her some leave here too. Glenn Yeffeth: Oh well thank you Gwen. You know, Leah Wilson's our editor and chief here at BenBella and she has, we've been working together, oh boy, over 15 years. And she is I think of her and I say it all the time, she's like our secret weapon, I mean she just is such a good editor but also so good at, it's not just about the words it's also about the feelings and the emotions and getting those relationships right that allow a good editorial process, so thank you. Gwen Cooper: Yeah, no, Leah's great. Leah, I would say she's macro and micro. She is definitely the person who will pull apart every comma, word tense, noun case and so on and so forth but who also takes a real holistic and birds eye view of the feeling throughout a story, the rises and falls, what it's trying to say, and will make suggestions that never make me feel like she's trying to insert her own ideas or change my voice, which is a thing that writers say. I always feel so pretentious when I say it, but it’s true. It always feels like my story but better. Gwen Cooper: I feel like we should stop plugging Leah now. Gwen Cooper: Because somebody might, make try to hire her and then we would both be incredibly miserable. Glenn Yeffeth: We're using her pseudonym, no one will know she really is. Glenn Yeffeth: Now for My Life in a Cat House, I just want to say, just finished it a couple weeks ago. And I will confess, I'm the last person who would pick up a cat book. Glenn Yeffeth: However, I'm divorced now ten plus years, but my ex-wife and I had four cats. For years. And they were never my cats, they were her cats, but I enjoyed having them around. And then I kind of missed them a bit when I left but I kind of forgot about it. Glenn Yeffeth: But reading this book and it was just so well written, and so captures just the pleasure and the personality of what it's like to live with some felines, really made me nostalgic for those days when we had the cats. So anyway I just wanted to say kudos for that. Gwen Cooper: Well I thank you, I feel like praise from my publisher is probably somewhat better than praise from my mother, but maybe not. Glenn Yeffeth: Not that much. Gwen Cooper: Maybe not that much more trustworthy, if my mom says the stories are great, she loves my writing style. I thank you, I am also sorry to have to inform you that your cats never thought about you again when you walked out that door. Glenn Yeffeth: Yeah, I believe that. Gwen Cooper: If they were your ex-wife’s cats, they were like, thank god that guys gone. Glenn Yeffeth: I think that's pretty much right, that's pretty much right. So now tell us about Homer and the Holiday Miracle, that's sort of a mini, I guess a novella, but it's a true story and it's releasing it for the holidays, coming out same time, end of October, as My Life in the Cat House, tell us a little bit about that book. Gwen Cooper: Yeah so, I mean, even novella is being really generous. It's a short story and it's sort of like a standalone gift book, and it's kind of like, the idea's for it to be a stocking stuffer. Gwen Cooper: So initially I wrote that last year as a free giveaway and that was for just the people who'd been following us on social media and my mailing list, and it was a little while since I'd written anything about Homer, and it was a thank you to them. Gwen Cooper: And then they really loved it and when you and I discussed it, we expanded it, we made it better, I mean it definitely is much better than it was in its initial written form and longer and more festive. Gwen Cooper: But you know, it was just a great story, and really in a nutshell, it's not a fictional story, it's not like Homer leads Santa's sleigh with his magical blind super powers or anything like that. Gwen Cooper: What happened in December of 2012 and it was two weeks before Christmas, was Homer had a minor phasing episode, I brought him to the animal hospital, the ordeal with that is its own little story because Homer, even though I brought him in unconscious, he was blind and weighed four pounds, and he was literally sick to death, held off the entire veterinary hospital staff. For an hour. Gwen Cooper: And then they banned him for life. And this was a hospital, I cannot even tell you, like they practically had a Gwen Cooper memorial wing built onto that hospital. My cats, my cats had been treated there for many years, we had certainly spent quite a bit of money and they were like, we don't care, just take this wretched cat out of here and never bring him back. Gwen Cooper: Homer was a difficult patient, to say the least. So anyway, what happened was, he came in, he had liver values that were 1500% higher than what is normal for a cat, and what that means is that the level of toxins in his blood that the liver would normally filter out, were 1500% higher than they were supposed to be. Gwen Cooper: The phrase that the doctor used who tested his blood work with me the next day was incompatible with life. His numbers were incompatible with life. Which is a very fancy way of saying, this cat should be dead already. Gwen Cooper: And do not expect him to live longer. And they gave me a two week course of treatment for him and told me to pretty much to expect that within two weeks or less he would not be with us. Gwen Cooper: And again, Homer had emphatically ruled out any more aggressive medical care, any hospitalization or anything else we might have considered doing for him. So we brought him home and prepared to, I mean really to celebrate Christmas with his passing. Gwen Cooper: Which was a very, it was a very unhappy thought and I guess to make a long story short, and spoiler alert, but he ended up living for another year, without treatment and sort of in defiance of all medical logic as to how this cat could even pick his head up. Gwen Cooper: Much less, and there's some great parts in the story where the vet is calling me, and Homer, he was like running, tearing around the apartment, bothering the kittens, stealing your toys, stealing our food, getting into all the kind of trouble with the holiday decorations that he always did. Gwen Cooper: And the vet called me, like he's probably experiencing some discomfort right now, we should talk about what we can do to make him feel more comfortable, and this was as Homer's like taking the chicken breast off my lunch plate, run off into the bedroom, I'm like, he doesn't really seem uncomfortable. Gwen Cooper: So that's where the story was, and I think that most animal lovers, anyone who's had animals for a long enough period of time, has these kinds of stories, the things that are not supposed to happen, they're not supposed to be possible. And the many ways in which animals surprise us. Gwen Cooper: I actually saw for the first time today that the Daily Mail has a Facebook video series called We Don't Deserve Animals. And its these incredible stories of these incredible things that animals do. And yeah, and this was really one of them. Homer showed everybody. Glenn Yeffeth: Wow. And you've always donated some of your royalties to charities, tell me a little bit about that. Gwen Cooper: Homer, obviously, because he's a special needs cat, and because he, the way that I came to adopt him, to make a very long story short, was that he's in danger of being euthanized because nobody wanted to take him. It's not really something that I'd foreseen when I published the book, but Homer was really embraced by the rescue community. Gwen Cooper: He really became sort of a poster child for not even just animal rescue but for those really tough cases, the cases that really break the hearts of people who work in rescue. These animals who they know just have these wonderful personalities and are so loving, but who don't get a chance because they are different or quote unquote undesirable in some way. Gwen Cooper: And when I was first hearing a lot of rejections from Homer's Odyssey, I had an idea that I wanted to see how many people in America lived with blind cats. I thought maybe that might help overcome some of the rejections, the objections that we were hearing from publishers. Gwen Cooper: Yeah, only two shelters in the U.S. who are specifically devoted to rescuing blind cats and kittens exclusively. And I had this really great pep talk with the executive director, who I'd never spoken with before, I just found her via Google and I called her. Gwen Cooper: And we ended up talking, and just since then I donate 10% of all my royalties from Homer's Odyssey to organizations that serve abusive and disabled animals. I was delighted to be able to give a $10,000 check from Homer's first week royalties in paperback to Blind Cat Rescue and Sanctuary back in 2010. And Homer's community has done, again, these are people who are passionate about animals and also have soft spots for rescue animals, particularly if they're following Homer and me. Gwen Cooper: And so we've raised half a million dollars in small donations over the last five years to donate to organizations around the world. Both to support their ongoing work and also during catastrophes like Hurricane Harvey last year, the earthquake in Nepal, the tsunami in Japan and things of that nature. Glenn Yeffeth: That's wonderful. Thank you for sharing that. Can you talk a little bit about your writing process? Do you write every day? Gwen Cooper: Well when I'm on a deadline I do. I'm definitely not a person who in between books or projects makes a point of writing every day. Although I usually jot down, now, now that I have a monthly series I am always in a constant state of at least taking notes on things that my cats are doing that I think might be fodder for a story. Gwen Cooper: I think it's really, if we're talking of process, which I guess sort of inevitably leads to advice for other writers, I would say that it's really important, I think the most important thing is figuring out if you're a day person or a night person and being honest with that. Gwen Cooper: And if you are a morning person you should plan on creating a long as possible morning, and if you're a night person you should plan on creating a long as possible night. But I'm more of a morning person, I get up at 4:30, I'm usually at the computer at five, and it's great to have those quiet hours from let's say, five to nine, before anyone is, even before the emails start coming in and the phone calls start coming in, and the worlds starts bothering me, distracting me from writing. Gwen Cooper: I honestly, I think carving out, silence is really the best friend of a writer, and distractions are the worst enemy. And so I think the most important thing a writer can do in terms of their process. Gwen Cooper: It's not just writing every day but carving out as many distraction free hours for yourself as you can, and even maybe pushing yourself a little bit until you get into that rhythm. It was not easy to come to a point where I get up between 4:30 and five. But I do now, and it's probably the best thing I ever did for my writing. Glenn Yeffeth: Boy, that's great, and it makes a lot of sense. And it's almost like the world has gotten where it's harder to block out that time, there's so many ways you can get interrupted. Gwen Cooper: Well especially, you know, look, Homer is a cat with a large internet following and not every, that's a somewhat unique position to be in as a writer, but every writer has the responsibility now of keeping up on social media. You want to be active on Facebook, on Instagram, on Twitter. Gwen Cooper: You want to be where your readers are, you want to be in conversations with them. That is how, I mean that's a big part of how you sell books. And it's amazing that authors have those tools. Gwen Cooper: But the flip side is they are also distractions, and they sort of demand a certain amount of immediacy. I mean you can post something in the morning and then check in on it eight hours later, but then you lose a chance for it to sort of create a momentum that your input will give it over the course of the day. Gwen Cooper: And so that's why I really feel that there are those times where social media is as quiet as it's going to be in the 24 hour cycle, usually early in the morning or late at night, and again, and that's just you communicating with readers, and that's before you get to your editor communicating with you, or talking to your marketing department. Gwen Cooper: Or the other things that you have to do as a business person in addition to being a writer. You know, like any other job. And yeah, it's finding the quiet hours I think is really key and more difficult than it was even ten years ago, but certainly essential. Glenn Yeffeth: Any thoughts on what writers could do better from a marketing point of view? Gwen Cooper: What I find has really helped me, is really maintaining that, you know, I was talking before about Leah being a sort of a macro and also micro editor. And I would say that you have to sort of take the same approach with your readership. Gwen Cooper: You want to do things that are going to reach as many people as possible, whether that's an event, whether that is starting some sort of campaign where you're trying to get people to share things on social media, or putting up posts that you think will be entertaining to your followers and hope will go viral. I am also in daily one on one conversations with my readers. Gwen Cooper: Obviously not all of them because that would be huge, but honestly as many as contact me directly, they email me through my website, they private message me through Facebook, they leave comments on my Instagram posts. Gwen Cooper: As many of them as I, am there, and as many of them as I can start to scoop up. I mean there are definitely comments and messages that just float by, if they come on a particularly busy day, whatever the case may be. I respond to every reader email. I respond to every reader comment or private message on Facebook. Gwen Cooper: I put up a September 11th post yesterday that got too many comments for me to respond individually, and then I will usually, I'll make a point about at least liking each one. You really want to dig in there and forge a personal connection. Gwen Cooper: And it's a lot of work, but I believe the payback is how you build loyalty, I think, among your fans, is for them to feel that they have a vested interest and you and that you have a vested interest in them and that it extends beyond your, it's not just when you're trying to get them to buy a book, but it's in the years in between those books coming out and you're still there for them. Gwen Cooper: And again, some of that is the particular, just to, I'm not trying to scare anybody off of the idea of becoming an author. I write memoirs, and especially when you're writing about animals, which is already a very emotional and personal subject for a lot of people, they feel a strong emotional connection. Gwen Cooper: And when you write a memoir, it really makes people feel like they know you and not just someone who's writing a book. So the idea of forging those one on one relationships has a little bit more urgency or likability, let's say, if you're writing nonfiction, you're writing memoir, something like that. Gwen Cooper: But having said that, I think that, yeah, one of the best, it's great to have marketing campaigns that hit a lot of people at the same time, and that is certainly something you need to work on especially as you come up to a book launch. Gwen Cooper: But it also really pays dividends to interact individually with your readers through social media, through email and other platforms. And it's definitely, I don't know that a lot of authors speak about it, they don't necessarily, you know, if they consider it an important part of marketing, but I really absolutely think that it is. Glenn Yeffeth: You know, I think you're absolutely right, Gwen, and these days there is the capability and there's the need to develop a following and I think someone called a book called a Thousand True Followers, just arguing that an author can build a career on a thousand people who really love their work. Glenn Yeffeth: And I think it's, and for somebody like yourself with many more than that, I think it's such a valuable asset that any publisher would be very excited to get access to, or it gives you the option like you've done in the past of self-publishing, and so it gives you, it gives the author a lot more freedom if they've got that group that they can rely on that values their work. Gwen Cooper: Absolutely, and again, you also want people, and this is the part of me that is a marketer, what you want are people not just who are buying your books, you want them to buy it as gifts for others, you want them to tell their friends to buy it, you want at the holiday season they buy two, three, five extra copies to give to other people. Gwen Cooper: And again to your point, a thousand true followers that you can build a career on, it's never just a thousand sales. These are going to be your product evangelists who talk about you to their friends and where they go, and who does a lot of your sales and marketing work for you. Glenn Yeffeth: Exactly, exactly. So last question, any, you've had a number of different kinds of publishing experiences, you're with a small press now, you were with a big press, you did some self-publishing. Any advice for the publishing community? Gwen Cooper: You mean in terms of like which do I think is best, or do I think people should try them all? Glenn Yeffeth: Well, anything you want to say is fine, but I was thinking in terms of what the publishers could do better. Gwen Cooper: Oh. That is an interesting question. Look, my feeling is always that there should be a little more emphasis, I mean not even just on PR but on marketing. Candidly that is a place where I feel, yeah, I mean just on a marketing efforts, I see a lot of authors and certainly not just me, there are things that authors do that blow me away that I would never have thought of, and those are everything from bestselling authors to small and scrappy independent authors, but who do really brilliant and innovative things, that I myself as an author find myself adopting. Gwen Cooper: I think that publishing as a whole could do the same, there's a lot of encouraging authors to do this on their behalf, but publishers also have a lot of big tools, they can help authors go further. Gwen Cooper: I think that there's still a lot of traditional emphasis, there's a lot of emphasis on the traditional things that are obviously crucial for a book that only a publisher can do, that's getting your book into book stores, that's getting reviews from major publications and those are all really important. Gwen Cooper: I think where a lot of publishers, just like I was just talking to authors, like keep your eye on certain thing that hit a lot of people at once and also on the individual level. I think publishers could do that too, I see a lot of publishers that are present on social media and they have portals online. Gwen Cooper: But the truth is, readers aren't loyal to a publishing brand, they're loyal to authors. And so where I feel that publishers, it's great that publishers build platforms where you can sign up to find out about all the new books that are coming out from X, Y, Z authors, you know, publisher in the fall. Gwen Cooper: But I think it's something that they could help there, I think publishers are in a position to help their individual authors go further with a little bit of elbow grease in that direction, because they're smarter, they have more institutional knowledge, they have more resources, they've been doing it longer. And that is definitely something I think would increase everybody's bottom line, truthfully. Glenn Yeffeth: No, I think those are valuable thoughts, I mean one of the maybe unfortunate dynamics we have these days is you have it exactly right, the authors are the ones that the readers are loyal to, not the publishers, and so as the author builds their platform, that platform is mobile with the author. Glenn Yeffeth: So for a lot of publishers I think there may be a little gun shy about investing too heavily in the authors platform, given that author may jump to another publisher the next book. And so it's a little bit of a catch 22 there. Gwen Cooper: Well, then I would say from my perspective, I mean, as someone who's been a marketer and so who's marketed other people's products that were not mine and that hypothetically could be taken elsewhere and also being an author, who I have my own books that I can take with me. Gwen Cooper: If you give people a reason to be loyal to you, they generally will be. I think if you are a publisher, you know, I think nothing, from an author's perspective, nothing is going to make an author jump ship faster than feeling like I did it all myself, what do I even need this publisher for? Gwen Cooper: Because I'm the one who wrote the book, and I'm the one who did all the marketing and I'm the one. And that may not be true, but I've certainly heard that from a lot of other authors. Gwen Cooper: Everybody wants to hedge their bets, you have to marshal your resources intelligently, as a publisher, when a number of different books coming out simultaneously and not just any one individual author, but you don't want to leave author's with the feeling that, if I fail, it's because the publisher didn't help me and if I succeed it's because I did it myself because in either case that's a reason for an author to go someplace else. Glenn Yeffeth: I think that's well said. Gwen Cooper: I think for no matter what your job is, whether you're an author or you work with a publisher producing an author's books, whatever your job is, you should always go into it with the goal of making yourself indispensable. Gwen Cooper: I mean, that's as a person who's been legitimately unemployable outside of being a writer, I can tell you to a certainty that the best thing you can do for your own career longevity is to prove yourself indispensable, I never managed to hack it before I got into writing, so. But I saw other people do it and I'm told that it was very valuable. Glenn Yeffeth: No I think that's very smart and I know for us, we work very hard to create an author experience that people want to come back to, and marketing is part of that. Glenn Yeffeth: And I think that is why most of our authors, very few authors who've done well with their first book don't come back to us for the second book and I think it's, I think you're, I think many publishers maybe forget that or they think of it as more transactional, but those long term relationships, you're absolutely right. That is the key to successful publishing over time. Gwen Cooper: Yeah, I think authors, I guess there's always the possibility that the author becomes successful and starts getting dazzled with huge offers from other publishers, but at the end of the day, everybody would like to just have that level of stability because it's one less thing to worry about. Gwen Cooper: I think most authors are not looking for a reason to leave a publisher that's published their book, I think they're looking for reasons to stay. And again, so what you don't want is to foster too much of a feeling of independence in them, because that I think sort of decreases that institutional loyalty that they would otherwise naturally build up. Glenn Yeffeth: All right publishers, including myself, listen up, this is very good advice. All right Gwen, tell us where we can find you online. Gwen Cooper: Yeah, so my website is gwencooper.com, online if you're looking to find me probably the best place would be somewhere in Homer's online community on Facebook, we're at homerblindcatfans, Instagram and Twitter we are @homerblindcat. Gwen Cooper: If you do just a Google search for Homer the Blind Wonder Cat you're probably bound to run into something that will eventually lead you back to me. Glenn Yeffeth: Okay, wonderful. All right well Gwen, thank you so much, this has been an absolute pleasure and you know I really appreciate our partnership. Gwen Cooper: Well thank you so much it's been a pleasure speaking with you. Glenn Yeffeth: Bye, take care. Glenn Yeffeth: Thank you for listening to the Building Books Podcast. If you enjoyed it, please leave a review on iTunes or wherever you happen to listen to it, or share it on social media. Glenn Yeffeth: If you're an author who wants to submit a proposal or pitch to BenBella books, please go to benbellabooks.com, click on the For Perspective Authors button, and it will lead you through a little form that makes it real easy to submit to us. Thank you.